A group of minority shareholders of GOLD HOLDING suspected that there were questionable financial transactions being undertaken in Gold AE DMCC (“the Company”). Acting on these suspicions they initiated internal investigations. During the course of the investigations the entire then management team abruptly resigned with no notice. Since the majority shareholders also seemed to be unavailable, the minority shareholders did not accept this resignation. However, these persons went to DMCC, submitted their resignations and managed to get their visas cancelled. Following this, in august 2015, Mr. Andre Gauthier has been appointed as the manager of the Company so that investigations continued and once completed necessary action can be taken to secure the interests of the clients and shareholders of the company. His appointment took effect from August 9 ,2015 . When he took over, new management realized that he now had access to more information concerning the activities of the previous management and, he realized that there had been substantial withdrawals from the company’s account to the personal accounts of some of the management and the majority shareholders. Management has also uncovered information with respect to the existence of a bank account with Arab Bank (Switzerland) Ltd in Switzerland in the name of the Company. An attempt has been made to approach this bank but, since none of the current management or minority shareholders are signatories to the account and, due to the stringent Swiss banking laws and regulations regarding confidentiality, no additional information or access has been provided by the bank. In order to try and secure/recover monies that had been taken out of the accounts of the company, Mr. Gauthier in his capacity as manager has filed various cases as against the recipients of the funds from the Company (Dubai Police ( Bur Dubai Police Station), Case No: 24378). The minority shareholders are doing everything within their powers to support him in his efforts to recover these monies that were withdrawn from Gold AE in questionable circumstances. DMCC has alleged that some of these activities undertaken by the previous management are in breach of DMCC’s rules and as such they have taken the decision to terminate the license of the Company. We are working closely with DMCC to find a solution and in the meanwhile, we request that you bear with us. In the meanwhile, as a statutory consequence of the license being terminated, the trading platform of the Company has to shut down as of the date of termination of the license which is 24th November 2015. We trust the forgoing is of assistance. 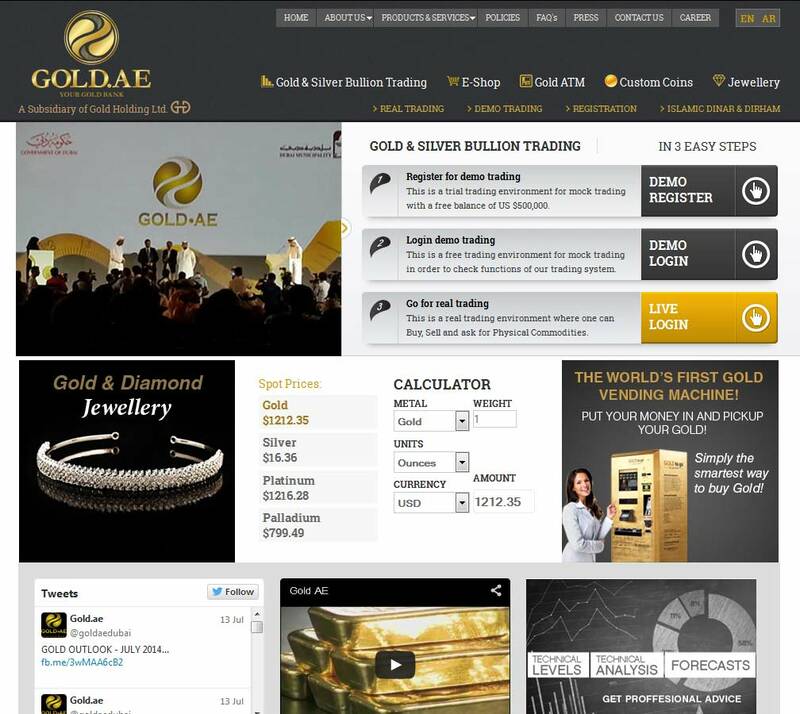 Gold Arab Emirate, Gold AE is the first corporate entity in Middle East incorporated in Dubai – UAE, for E-Commerce of Gold & Silver bullion being its core commercial activity. Gold AE is led by an experienced team of seasoned bullion professionals which gives it a competitive advantage over contemporary firms in the market and gaining a remarkable reputation as an emerging market participant in the gold markets of the gulf. We’ve received a large number of complaints saying Gold.ae have ceased trading and are no longer answering phone calls or emails. 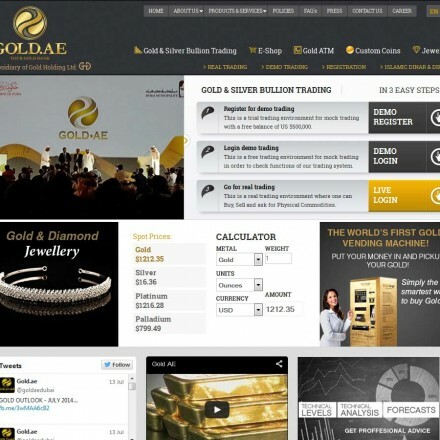 Their trading portal at https://trade.gold.ae is no longer functional and investors are unable to access their accounts or funds. In its capacity as the licensing authority for the DMCC Free Zone, DMCC has conducted an internal investigation into the allegations of fraudulent activity by Gold AE, a wholly owned subsidiary of Gold Holding Limited (a DIFC licensed entity). As a result of this investigation, DMCC has terminated the trade licence for Gold AE. The decision was “final, binding and non-appealable”. The DMCC has advised those left out of pocket by Gold AE to refer complaints to the DIFC or Dubai Courts, although contracts state that the DMCC must appoint arbitrators to settle disputes. DMCC recommends complaints be passed to DIFC who can be contacted here. Gold.ae are part of the multinational Gold Holding Ltd, based in Dubai and providing professional gold services across the Middle East, Turkey, Switzerland and Peru. Gold.ae is best known for being the first online retailer of bullion bars and coins in the Emirates and has seen substantial growth as retail and professional metals investors in the region move their gold and silver buying increasingly online. As a large scale precious metals dealer, the Gold.ae website and sister sites contain well detailed company, service and product information on each aspect of their business. The e-commerce section for which they are best known contains good product information, clear images and live pricing in AED. There are particularly useful FAQ covering e-commerce and online trading with an instant live-chat facility for the unlikely event a customer cannot find the information they require. Despite it’s size, the Gold.ae website is easy to navigate with clearly signposted menus and all major content instantly accessible. All content is available in English and Arabic. The site is clean and modern in layout, with acceptable sized dark grey text on a white background. All legal and contact information is easily located. Like many gold dealers in the region online reviews for gold.ae are scarce, but all reviews we found are positive citing quality of service and low premiums. Hello Aamir, we understand a group of investors are preparing a class action suit – see http://www.thenational.ae/business/markets/customers-of-dubai-firm-gold-ae-to-start-legal-proceedings-over-access-to-accounts – but unfortunately know little more than that. Perhaps speak to some lawyers in the area and see if you can join the case. May Allah give those criminals what they deserve from shameful doom,, It is not game to win by steeling, steeling others right will take that person to the hell forever because that our right and Allah will not give any mercy for that kind of people, May Allah give patience for all victims. Gold AE not yet returned my money nor delivered gold and silver worth AED 135000. I had transferred in gold ae account. I have investment with GOLD AE as well, I am aggree with Mr. Hisham, all investors need to get together and take a legal action. Dear investors, has anyone taken any action of any sort , even legal ,against GOLDAE or its Holding company? Should we just wait and let our hard earned money and savings disappear into thin air, and let greedy thieves enjoy our hard work. Please respond and let us get together , all of us, so our efforts can hopefully lead to something. I request authorities of dubai to do justice to us by paying back our money transferred to their account. I have an account with them for more than 4 years , they were good , always saying that hey are strong , trustworthy company . Even they told me that they store the physical gold in a safe that is supervised by the auhtorities . The last events shows that they are disrespectful to their customers. I therefore sincerely request the local authorities to kindly help all the customers of GoldAE in this matter to get all of our hard earned money back as soon as possible. We are ready to cooperate in any way required & at all levels. I believe in the law & have full faith in the local jurisdiction that they will help us in all possible ways to get our money back. I request to all concerned to help us in recovering our hard earned money. If Dubai do not fix that problem, I think the repution of investing in Dubai will go down, Many investors will not trust the environment of investments there, Also the investors will not invest the money in Dubai again, it is not a game to give any company a license to steal investors by law!!! At the moment l tried to find asolloution with Difc ,who are a responsible by giving a license to gold Ae ,but they ignore me without any news or hope. My condolence to all the investor and advice not to invest in these type of online companies no mater how big and strong they are one day they will run away without leaving trace. Appreciate any feedback if any of you receive. Unfortunately I invested with them and I lost my saving with them. I hope to share me any hops to return our investments, Is there any news about that company???!! I have an account with them for more than a year , they were good , always saying that hey are strong , trustworthy company . Even they told me that they store the physical gold in a safe that is supervised by the auhtorities . I heared that they had problems with the management even before i open a trading account, but when i checked with them and their office , everything seemed fine , so i opened an account , now i have 139,000$ stuck with them , i wish that all inverstors money are safe as they say. Very unfortunately the story of Gold.ae scandal unfolded in front of my eyes leading me into a state of shock. My investment is as good as gone for good. The amount is not too big but was based on trust in Dubai laws which now I see is quite weak. Another blow to consumer confidence. I am not interested in chasing this company nor its sponsors because I know nothing can be gotten back. It was a business disguised to serve certain vested interests and due to some political changes in the region few months ago, the business is no longer needed – this is my personal understanding of the situation. My faith in Dubai business rules and regulations, laws and confidence in investigation agencies has reached the lowest point possible. My condolences to all the investors including myself. Attention: Gold AE have now formally closed all trading operations and have sent an explanatory email to clients. We have added a copy of this email to the listing and will keep our visitors informed of progress. How this situation is resolved will have a huge impact on Dubai’s trust level as a bullion trading hub, so we truly hope it is resolved speedily and to client’s full satisfaction. How could Mr. E***h cancel his visa through a court order then open a precious metal company in Dubai . That is mean only that the man has nothing to do with the ongoing issues otherwise the authority will not clear him . Mr. D*** had two different posts in two different companies which came to be a competing company , where is the audit of Gold holding ??? I believe that the problem is a lot bigger than this and Gold Holding is preparing the customer for more bad news when they said that they could not recover the assets. Go and look for the missing founder ..,!!! And has multimilion investments in UAE and the world . I also have some investment with gold .ae Yesterday they sent email through their help disk They have mentioned , A criminal case was filed in Dubai Court against the previous management They have been blaming the pervious managment for stealing the clients money and assets claiming that the pervious management has left with out any handover ! The whole story doesn’t make any sense and I can’t understand how the company founder and managing director left the company and the new management take over without any handover of the company assets or bank accounts I believe the current management were aware of the ongoing issues , they have mentioned the company founder was missing since March this year , I actually open my account in August ! I am in the same situation, I have invested a lot of money in their gold. I want to ask if any body has tried to start a legal action in DIFC ? Does any body recommend that and how to do it ? Thanks for reply and article. This article is dated 28 November and DMCC already verified in that article. I got reply from consumerrights and they said “Please accept our sincere apologies for not being able to process your complaint as we do not have authority over free zone companies. Kindly contact the respective Free Zone Authority.” I dont think freezone will be able to help as they are not governed by DFSA rules as mentioned in the independent article. Gold.ae website is still fully operational with all information and having same vision and mission as mentioned before on their website. I even tried to open demo account and I am able to open demo account. Can they still operate and allow customers to open demo account if DMCC has suspended their licence? Please look at the comments in the article and you will see there are many in a similar situation – it is our sincere wish that DMCC and DoED do something to resove the situation quickly so no further damage is done to the international trust in Dubai’s growing bullion trade. I have been trying to contact gold.ae many times past 6 months. I also requested for withdrawal request 5 months ago which they have still not given the money. Initially when I spoke to them they said client money and gold is secured and guaranteed and they should get decision in 4 weeks but now they are saying client’s funds and gold is not guaranteed and also not sure if they will return client investments and funds. I have money and gold lying in my account, now I can’t even log into my account. I spoke to one of their employer, she said she got her salary late and that also in cash. She also said, if they take customers side Gold.ae is threatening them to fire them. This is really frustrating and goes to show there is no customer protection while they initally claimed on their website all customer investment is secured and guaranteed. I know buygold.ae will not entertain individual claims but who do we approach when gold.ae itself are not answering calls or responding to email. Any kind of help will be good. Hello JP sorry to hear about your situation. It’s DMCC who we quoted as not looking into individual claims, and we’ve since learned that DMCC have allegedly stripped Gold.ae of their license (although it’s important to note DMCC have not yet verified this to us). In the meantime, we’d advise you to seek redress through legal channels if you suspect any illegal or fraudulent activity – and to certainly contact http://www.consumerrights.ae/ within the Department Of Economic Development. Please keep us updated with your situation. I got to know today that the company license has been cancelled by DMCC, and there is a case which is going on in the court. The situation is not clear and no idea what is going to happen to our investments! I have the same problem. I have been trying to contact gold.ae over the phone and emails without any response. I am currently out of AE and not sure what should be the proper action to rescue our money. Any help or recommendation? I have been trying to contact them for two weeks by email and phone without any luck. I am started to think they have fled away with our investments. I will try to check their offices today or max tomorrow, and let you know. Appreciate any feedback from you. Ahmad – we’ve now tried contacting them several times by email and telephone, with no reply and have now contacted the parent company Gold Holding Ltd.
May we suggest you try contacting DMCC and enquiring there as to the situation – we have opened a case with DMCC, #00191293 and will update this comment with their response. Thank you also for notifying our visitors as to the non-functioning of the Gold.ae trade portal. We have now added an “alert” to their directory listing until the situation has been clarified. **Update** DMCC are currently trying to contact Gold.ae but say they will not get involved with individual disputes or arbitrations and it is up to individual clients to seek recompense. can anybody update whether gold ae will resume its operation or not. presently they are not dealing well to customers who have thousands dollars investment with them. what will happen to people investment lying with gold ae. Ali – we’ve tried contacting Gold.ae, but have not yet received a reply. We will update this post shortly. I am agreeing with Samia and Ali Gold.ae are kings of the gold business here in Dubai. If problems had a telephone call is all needed for instant resolution or for advices from expert. Gold.ae are an exceptional service provider and I have noticed of late that thanks to their fixed dollar exchange rate, purchases can be had at a little less than spot if one is to take into effect current dollar Market rates. I know this as several friends of mine based in the States have been taking advantage. Personally I would recommend a trading account with gold.ae as I have yet to find a lower cost and more advantageous route to investing in bullion. Gold.ae are most excellent at the dealings always helping at all steps in the processes. The most beneficial convenience is assuredly the buying of gold online and all times I buying it is at a fair price moreso than buying from traders. 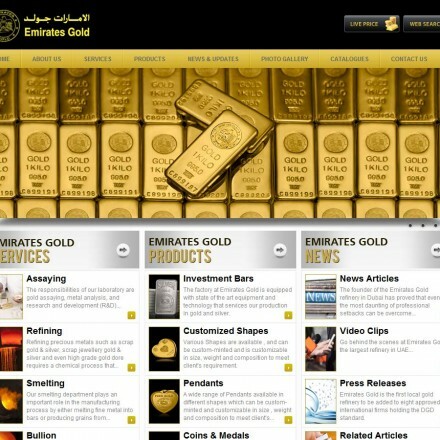 Our Gold.ae reviews are powered by Bullion.Directory - The Metals Investment Portal.